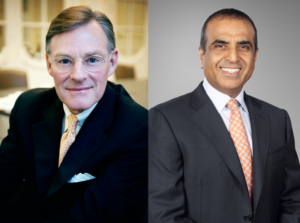 ICC is pleased to announce it has elected Harold McGraw III to become Chairman of the International Chamber of Commerce, and Sunil Bharti Mittal to become Vice-Chairman, effective 1 July. Harold McGraw (left) elected Chairman of ICC, Sunil Mittal (right) elected Vice-Chairman. The current ICC Chairman, Gerard Worms, will become ICC Honorary Chairman. Harold (Terry) McGraw has been the Vice-Chairman of ICC since January 2011. He is also Chairman, President and CEO of The McGraw-Hill Companies, soon to be named McGraw Hill Financial, one of the leading financial intelligence companies in the world with iconic brands like Standard & Poor’s Ratings Services, S&P Dow Jones Indices, S&P Capital IQ, Platts and JD Power. Mr McGraw is also Chairman of the US Council for International Business, and Chairman of the US President’s Advisory Committee for Trade Policy and Negotiations. Appointed by US President Barack Obama to the US-India CEO Forum in November 2009, Mr McGraw also serves on the boards of United Technologies and Phillips 66, and chairs the Emergency Committee for American Trade. “I am honoured to be elected as Chairman of ICC, the world business organization comprising over 6 million companies and chambers of commerce in 130 countries. ICC is playing a crucial role in driving global economic growth and promoting trade and jobs. I look forward to working with Sunil and other distinguished members of ICC to advance this agenda and address the needs of the international business community,” said Mr McGraw. Sunil Bharti Mittal is the Founder, Chairman and Group CEO of Bharti Enterprises and the Chairman of Bharti Airtel. Bharti Enterprises is one of India’s leading business groups with interests in telecoms, retail, realty, financial services and agri-products. Bharti Airtel is the flagship company of Bharti Enterprises, which is among the leading global telecom companies with operations in India, South Asia and Africa. Bharti has joint ventures with several global leaders: Singtel, Wal-Mart, AXA and Del Monte. “It is an honor to be chosen for the role of Vice-Chairman at ICC, a prestigious organization dedicated to spreading peace and prosperity through trade since 1919. I look forward to working with Terry in this capacity,” said Mr Mittal. The ICC World Council elected the new ICC leaders at a meeting held in Doha, Qatar. In addition to these appointments, ICC also named five new members to the Executive Board: Esko Aho (Finland), Milos Barutciski (Canada), Frederico Curado (Brazil), Eduardo Eurnekian (Argentina), and Cherie Nursalim (Indonesia). They will also begin their terms on 1 July 2013. For more information on ICC’s leadership, visit the governance pages of the ICC website.